Extrusion screen changer (filter) is a composed of one or more filtering net automatic switching device, used in plastic material flow filter material containing particles and filter out impurities. 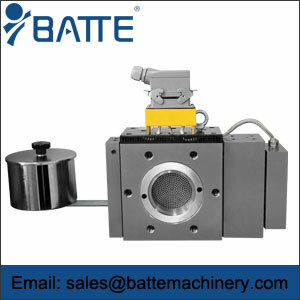 Filter by a alloy porous plate or metal mesh piece bearing and porous plate or a metal screen installed in the filter of the carrier, carrier is composed of a hydraulic cylinder hydraulic push in a system of working position and off-line non working position switch between. The filter net of the old plastic extruder is fixed on a porous or grooved protective plate, so that a sealing can be formed between the extruder filter and the mold. The pressure generated by the clean filter network is smaller, probably only 50 ~ 100lb/in2. With the increase of working hours, the number of impurities and particles in the material which is trapped by the filter is changed much, and the filter is blocked.